1. Black and white photograph of young boy wearing t-shirt and shorts , standing below window sill with flowerbed behind him. Insribed on back: "love from wee Brian"
2.Sepia studio portrait of short blonde hair toddler, holding abacus. Mounted on brown card in notelet form. Taken at Hampton's Studio, Christchurch. 3. Sepia studio portrait of 4 children, 2 girls and 2 boys. Boys are seated in centre with one girl at either end. Mounted on brown card in notelet form. 5. 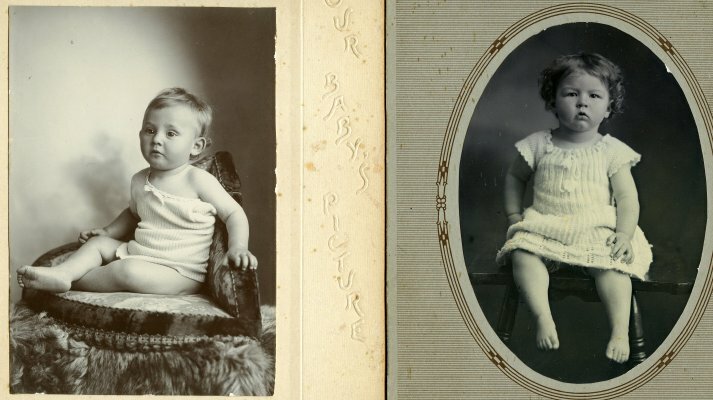 Black and white studio photograph of 2 young children - curly haired boy and girl, seated on stool. Mounted in notelet form on brown card. 6. Black and white studio portrait of small toddler, dark hair, seated. Taken by Macey of Blenheim. Mounted on green card. 8. 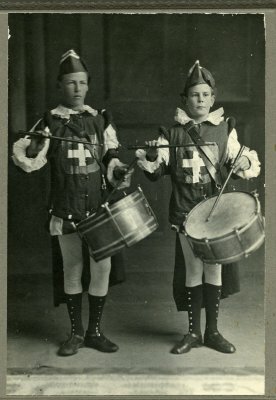 Black and white photograph of 2 boys, wearing uniforms, with drums. 9. 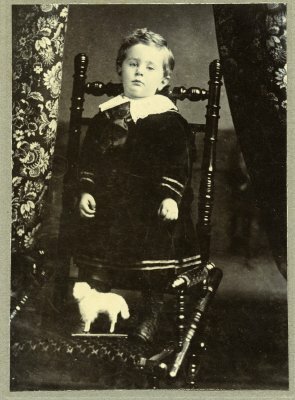 Black and white studio photograph (x2) of young boy, Gordon Stirling, standing on chair seat. Mounted on grey card. 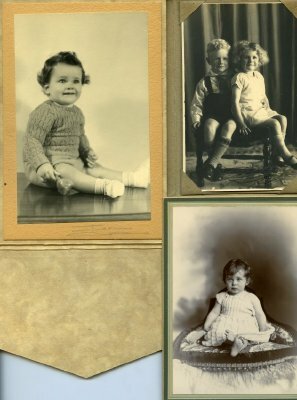 Original on cream card, studio photographer Macey's of Blenheim. 10. 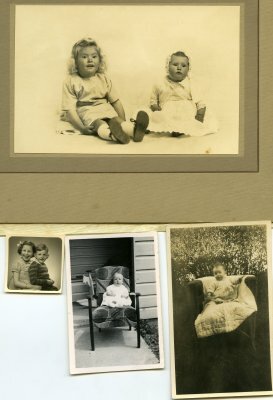 Sepia photograph of young girl and baby, seated on ground. Mounted on beige card. 11. 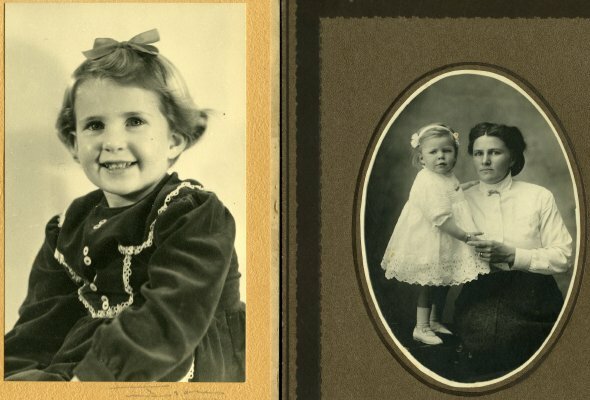 Black and white oval photograph of toddler and woman, mounted on brown card. Studio: Chas J. Allen, Palmerston North. Insribed on back: " Compliments of seaon. To Ethel with love from us all. Xmas 1913." 12. Black and white oval photograph of toddler, seated on stool. Studio: A. McCusker of Blenheim. Mounted on grey card with brown stripe. 13. Black and white studio photograph of young toddler, seated. Mounted on cream card embossed with "Our Baby's Picture. Name:____ Born:____" - details have not been filled in. Studio: Macey. 14. 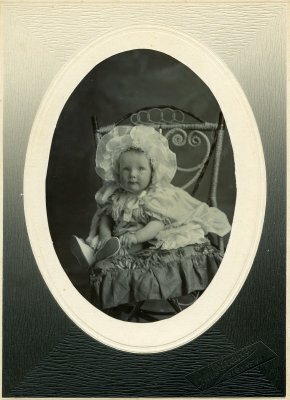 Black and white studio photograph of baby in bonnet, seated on chair. 15. 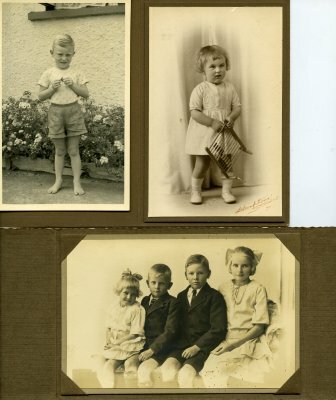 Small black and white photograph of two children, one boy, one girl. Noted on back: "Taken at Christmas". 16. Black and white photograph of baby seated on armchair, taken outside. 17. Black and white photograph of baby seated on blanket on chair, taken in garden.